Below, find TWO sets of "Do's and Don'ts from different international doctors, each with extensive experience working in Afghanistan with Afghan women. Many women patients just need a listening ear to hear about the hard life they have and the complaints they have medically are often an expression of this struggle. (So learn the language so you understand them and can respond!). Some women use some medical reason (like vaginal bleeding) to get out of the house to see the doctor (and the bazaar and the world outside their yard) and therefore, may not have any findings on exam. Many are abused and any western medical person longs to get them 'help'. Turns out despite all the 'Women's rights' groups and talk here, there isn't much 'help' available (at least what a western mind would see as help...ie. safe house, jail sentence or restraining order for the husband/perpetrator, any way out of a bad marriage with guarantee to keep or at least see the kids, etc. etc.). So prepare yourself for that frustration. And again prepare your listening ear. Don't come using providing health care as your 'way in' and not be prepared to do it. Don't put yourself in a situation where you are the only doctor serving a population. You won't last long (and this is true in expatriate or national populations). Prepare to disappoint when helping Afghanistan women. Don't expect women to be happy if you tell them they are well don't need medicine...that's what they came to you for. I'm not saying you give in and give them whatever medicine they want (that's what the Afghan docs do for the most part and is a big problem for obvious reasons), but be aware that your doing 'good' medicine will initially be looked on by the women as 'bad' until they get to know you, see how you really listen to them, examine them (do more than just a blood pressure, which most women think is the exam) and want the best for them. Don't expect to use all the modern tests and medicines...they are mostly not available, or only at high cost. If you are still in training...hone in on those physical examination skills so you can be more confident when that is ALL you have and no CT or U/S etc. to 'confirm' your diagnosis. Don't expect people to wait peacefully/patiently to see you, in line, etc. Imagine 'free for all' people pushing at the door for their turn to come sooner. Don't expect to talk to just the patient...anyone nearby will put in their two cents! ALWAYS respect female patients' privacy. They are VERY conservative and so many have never had a proper physical examination, so they don't know how to act during certain examinations. They try to cover themselves up the whole time while you want to expose the body part you examine. Some will not even lie down on the examination coach. Tell them what you're planning to do, whether examining or doing a procedure. Always get permission from the patient to proceed in examinations and procedures. If it is a girl, she will always be escorted by her mother and/or a male family member. Ask permission from them as well. Remember to send the male family member out of the consulting area. They are usually willing to leave. It is not strange to have the husband/male answering all the questions that are directed towards the female patient. Make sure that she understands the questions and that she agrees on the answers given, in a friendly and respectful way. Whatever treatment you plan to give, must always be discussed with the husband/ male family member. Family planning may NOT be prescribed without the husband's consent, whether he is there during the visit or not. Unmarried girls may NOT have a gynecological examination. From long experience helping Afghanistan women, I strongly recommend that female heath care providers stick to examining female patients and children only, since men may take advantage of a female health care provider. If you have to consult men, ALWAYS have another health care provider with you in the examination area, and NEVER examine the area between the belt and knees. These "Do's and Don'ts" for helping Afghanistan Women come from American-trained doctor friends of mine with years of experience working in the big cities and remote villages of Afghanistan. 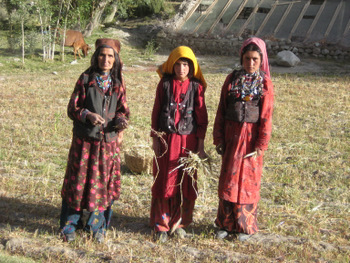 If you have additional questions regarding helping Afghanistan women, please feel free to contact me.